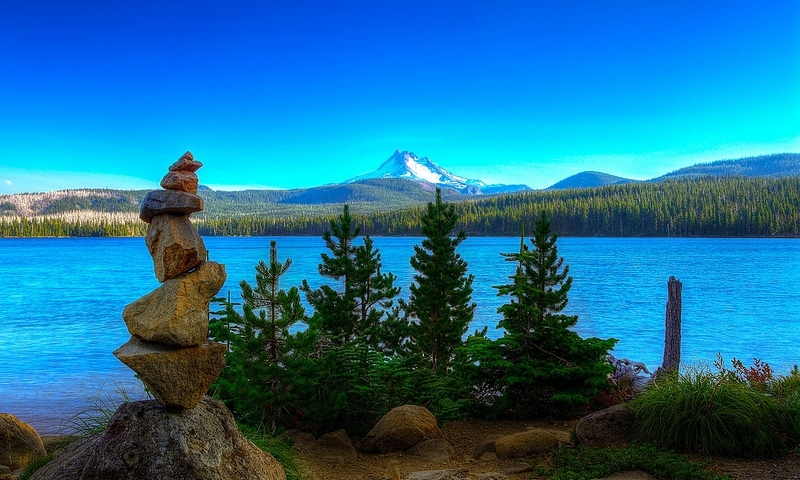 Located in the beautiful Mount Hood National Forest northwest of Bend, Olallie Lake is a pristine mountain lake known for excellent fishing, spectacular scenery, and views of majestic Mt. Jefferson in the distance. Stocked with both brook and rainbow trout, the lake is a popular fishing location. Seven campgrounds surrounded by beautiful forest provide ample sites to pitch your tent. Accessible via two forest roads, the lake lies northwest of Bend near the Warm Springs Indian Reservation. Hike the Pacific Crest Trail which passes near the lake. Named after the Chinook Indian word for “berry”, Olallie Lake, Oregon, is surrounded by beautiful scenery typical of the Mount Hood National Forest. One of several lakes in the Cascade Range, Olallie Lake covers 240 acres and has a shoreline of just under 4 miles. The Warm Springs Indian Reservation is not far from this beautiful lake, and the scenic Pacific Crest Trail passes close by. Several well-developed campgrounds and excellent trout fishing attract outdoor enthusiasts to the lake and surrounding area. Olallie Lake, OR, is located several miles northwest of Bend. It is accessible via two forest roads which are closed during the snow winter months. Mount Hood National Forest, 16400 Champion Way, Sandy, OR 97055. Phone: 503-668-1621. Fishing – Anglers often catch rainbow trout weighing between 5 and 17 pounds in this beautiful lake. You can fish for both rainbow and brook trout from the shore or your boat. Camping – There are seven different campgrounds in the Olallie Lake Scenic Area which provide ample campsites for visitors to the lake. The sites are surrounded by beautiful hemlock and fir trees. Beautiful Mt. Jefferson, which can be seen from the lake, is Oregon’s second highest peak at 10,497 feet. The lake’s surface elevation is 4,941 feet, and it has a maximum depth of 43 feet. Brook trout and rainbow trout are regularly stocked in Olallie Lake by the Oregon Department of Fish and Wildlife. Listed on the National Register of Historic Places, the Olallie Lake Guard Station is situated near the western shore of the lake.